Human consumption (as in flesh of, not spending habits) onscreen isn’t so disturbing when it’s a vampire or a werewolf gnawing on your fellow being as an hors d’oeuvre, but bring that in a little tighter, where man’s dining on man for sustenance and it becomes down right creepy. Even the understandable plight of the “Alive” survivors who chomped on frozen stiffs to keep themselves going in the high Andes, educes a shudder; and there’s still reports of ritual cannibalism among remote tribes in Borneo, but what if it was next door, and not something perverse and of a sick mind like Jeffery Dahmer, but a long standing family tradition executed in the name of God? Meet the Parker family. They feel like lost cast members from “Little House on the Prairie,” yet live in the modern suburban remotes of upstate New York. Mom (Kassie Depaiva) handles everything culinary, from the ritualistic harvesting to the careful trimming and lengthy rendering process, which results in a savory stew, but right off the bat, mom has a seizure in the middle of a flash storm, vomits up heaves of blood, and is gone. Her grisly duties then fall to her daughters, Iris (Ambyr Childers) and Rose (Julia Garner), though after the death, father (Bill Sage) declares a period of abstinence, which allows for the macabre outer sheen of the film to ebb and the edgy backstory of how the Parkers came to their generations old practice, to fill the strange now as the girls struggle to come of age (a time of sexual awakening for Iris) and dad goes through maniacal mood swings and Parkinson-like fits. The film directed by Jim Mickle, who amused with the quirky vampire hunter saga “Stake Land,” is fairly loyal remake of the 2010 Mexican film of the same title. That cult staple was set in the impoverished barrios of Mexico City and Mickle’s relocation to the drab Catskills brings home the grim affect with greater visceral resonance. 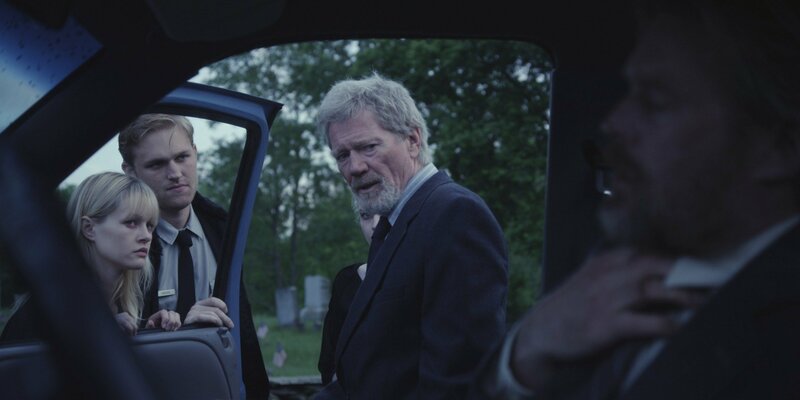 He also leverages hurricane season (the 2011 storm Irene was upon the area when he shot the film) as a cleaver plot device as the rising waters from the ongoing storms begin to unearth and expose the bones of the Parkers’ past feasts. Little of the barbaric practice makes it onto the screen for much of the film, but the traces are ever there; be it the missing person reminders that pop up in conversation or an information flash (reminiscent of “Prisoners”), the muffled whines that come from the Parkers’ root cellar or the inquisitive coroner (Michael Parks) who starts putting together the pieces–literally. If the plausibility of that sounds a bit hard to swallow, Sage does an effusive job of making the sell as the righteous propagator and controller. Childers too lends credibility as a young woman torn between wanting love and a normal life and familial obligation to her aggrieved father and siblings. It’s her burgeoning courtship with the bashful deputy (Wyatt Russell) and the coroner’s personal need for answers that become the catalyst for the hellish denouement that will not sit well with the squeamish. In the mix too is Kelly McGillis, barely recognizable as the frumpish next door neighbor who shows Parker’s young son (Frank Gore) compassion, administering bedside TLC and remedies to the boy bedridden with shakes and a fever. She thinks it’s a just common cold from the bluster and rain outside, but it’s hunger from the abstinence–a point that’s driven home and sets off a light in her head when the anemic seeming towhead suddenly chomps down on her thumb with frenzied lust. For an indie cult-horror film, “We Are What We Are” succeeds modestly much in the same way “You’re Next” did. It transcends the genre’s trappings and makes the most of its humble resources with confident craftsmanship and nuanced subtly that embosses character and demonstrates care. It’s not going to re-script the genre by any stretch, but for those who have the yen, it is a sating bowl of gruesome gruel.